In the last post in this series I quoted what Joseph, Cardinal Ratzinger, as he then was, Pontiff Emeritus as he now is, had to say about the theology of sacrifice. The language of sacrifice has been played down in the reformed liturgy to such an extent that it has allowed theologians and catechists to put forward a non-sacrificial theology of the Mass (the 'shared meal' stuff we are all familiar with). However, while this may be compatible with the texts of the Novus Ordo (if you ignore Eucharistic Prayer I), this needs to be read in the context of the whole teaching of the Church. This teaching hasn't changed: the silence of the Novus Ordo can't and hasn't changed it. Clearly it would be better, from this point of view, if the 1970 Missal made things clearer, but the reformers had other considerations in mind. I mentioned in the last post Bugnini's well-known hope to remove from the Catholic liturgy everything which could be offensive to Protestant ears. This might be a worthy or a wrong-headed ambition, but it is at any rate a reason for changing the liturgical texts which doesn't in itself imply that they previous texts were theologically inaccurate, rather than just undiplomatic. What Bugnini thought in his heart of hearts I do not know. But I'm sure the point about ecumenical diplomacy seemed important to Pope Paul VI. We can summarise what I'm saying in this three-fold scheme. 1. 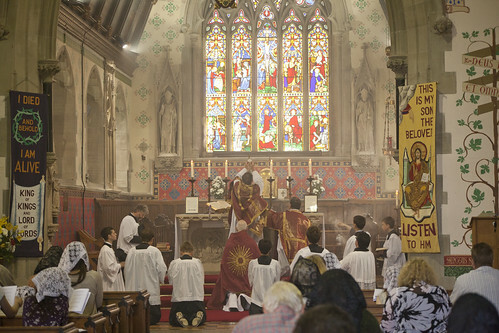 The theological implications of the traditional practice: the sacrificial nature of the Mass. 2. The official motivation of the change: ecumenism. 3. The implications which the new practice appears to have, which are incompatible with (1): that Mass is not a sacrifice after all. The implications under (3) are wrong: they are a misunderstanding of the Novus Ordo which need to be corrected by catechesis, a process which will be hugely assisted by the existence of the Vetus Ordo as a part of the Church's liturgical life. On the other hand, a common turning to the East during the Eucharistic Prayer remains essential. This is not a case of accidentals, but of essentials. Looking at the priest has no importance. What matters is looking together at the Lord. It is not now a question of dialogue, but of common worship, of setting off towards the One who is to come. What corresponds with the reality of what is happening is not the closed circle, but the common movement forward expressed in a common direction for prayer. (p82) '[A critic] thinks that turning to the East, towards the rising sun, is something that nowadays we just cannot bring into the liturgy. Is this really the case? Are we not interested in the cosmos any more? Are we today really hopelessly huddled in our own little circle? Is it not important, precisely today, to pray with the whole of creation? Is it not important, precisely today, to find room for the dimension of the future, for hope in the Lord who is to come again, to recognise again, indeed to live, the dynamism of the new creation as an essential form of the liturgy? It can't be emphasised enough how strongly Pope Benedict felt and feels about this. The 'Benedictine Arrangement' of candles and cross on the Altar even with versus populum celebration is a compromise attempt to overcome what he regards as a truly serious problem with the modern practice. Nor was are these implications much to do with the official motivation for the change. When Fr Pius Parsch and others started experimenting with vs. pop. Masses between the wars, they just wanted to enhance the involvement of the Faithful by letting them see the ceremonies more clearly. This then fed into the reform. It really is that simple. They had no idea what the further implications would be. 1. The implications of the traditional practice are a 'common turning to the Lord', eschatology, openness, unity in prayer. 2. The official motivation for the change is to promote participation. 3. The apparent implications of the new practice is the 'closed circle', the community worshiping itself, and so on. This is incompatible with (1) but it is wrong, it was not what the Novus Ordo was promulgated to mean. In this case, while the motivation for the change is very easy to understand, it is clear that we have ended up with something problematic. 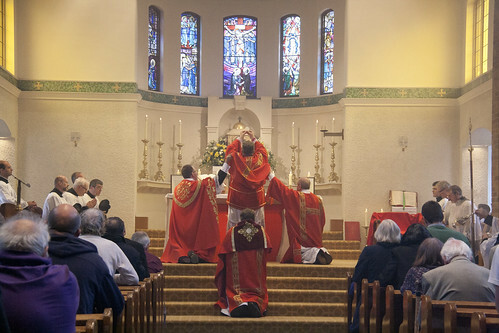 One of the problems is that critics of the Old Mass can go around saying that ad orientem celebration is theologically bad, it excludes the Faithful and so on. 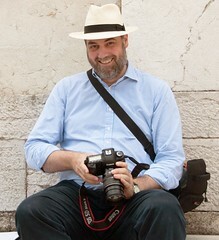 A more serious problem is that it seems, not just to trendy theologians but, often in a subliminal way, to the Faithful themselves, to imply a set of things which are incompatible with the very notion of Christian worship: that it is about looking at the other worshipers, catching the eye of the priest, and holding hands in a circle in a cosy little clique, and not intrinsically public, open to all, and opening out to the Lord and His coming in Glory. There is a lot more about liturgical orientation, the history and the theology, in this Position Paper on the subject. Next I will look at Cardinal Ratzinger on silent prayers and kneeling. Is the theology of the Vetus Ordo wrong? Are supporters of the Traditional Mass dangerous? Communion under Both Kinds: or not.